How do I make a Crusha milkshake? It’s like squash for milk! Simply add 1 part Crusha to 7 parts cold semi skimmed milk. No mixing or stirring required! Are the flavours and colours used in Crusha natural? 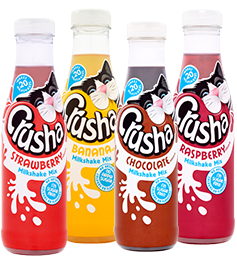 Yes, all Crusha milkshake mixes are NAFNAC (no artificial colours or flavours). How much sugar is there in Crusha when made up as directed on pack per 100ml? What sweeteners are used in Crusha? We use Sucarlose and Acesulfame K in our No Added Sugar variants. Our standard, which is only available in a 1 litre format, uses Sodium Saccharin in the Strawberry, Raspberry and Banana flavours. Our Chocolate 1 litre does not contain sweeteners. Is Crusha suitable for vegetarians? Yes all of our Crusha flavours are suitable for vegetarians and if mixed with a dairy alternative also suitable for vegans. Can Crusha be mixed with milk alternatives like soya or almond milk? Yes Crusha Milkshake Mix is delicious with non-dairy alternatives. How should I store Crusha once opened? We recommend storing Crusha in the fridge to keep it as its best. Where can I buy Crusha? Crusha Milkshake Mix is available to buy in most major supermarkets - see stockist information. Can Crusha bottles be recycled? Yes, Crusha Milkshake Mix bottles can be recycled (please remove sleeve before recycling).